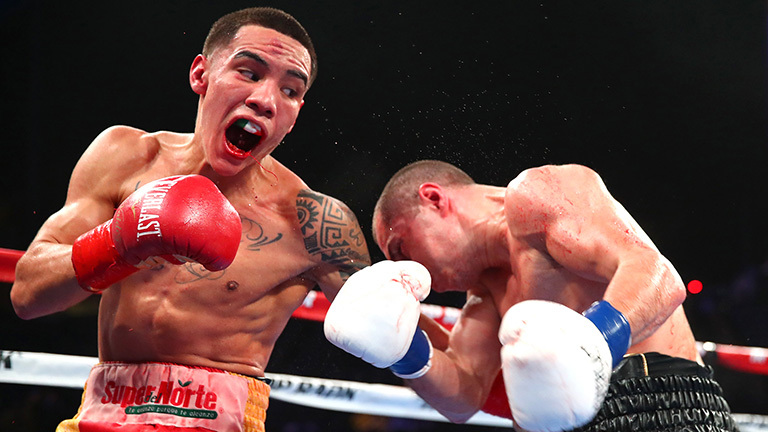 Undefeated WBO featherweight champion Oscar Valdez 24-0 (19) has changed trainers as he recovers from a broken jaw. The 27-year-old Mexican, who suffered the injury while outpointing an over-the-weight Scott Quigg in March, has left Manny Robles to train with Saul “Canelo” Alvarez’s coach Eddy Reynoso ahead of a planned return to the ring in early 2019. “I want to thank Manny Robles and his whole team for everything they have done for me over the last few years, but like everything in life, changes are sometimes needed to move forward,” said Valdez to RingTV.com. Robles was in the corner for Valdez’s five world title fights, leading him to victories over Genesis Servania, Miguel Marriaga, Hiroshige Osawa, Matias Rueda and Quigg. Reynoso is highly regarded after helping transform Alvarez from a typical Mexican slugger to a measured counter-puncher with an educated jab and smart defence. “This is a challenge for me because Oscar Valdez is a great fighter and one of my goals is to work on what’s necessary to make him a complete fighter,” said Reynoso. With Valdez sidelined with his injured jaw the WBO sanctioned an interim title fight between former IBF super bantamweight king Carl “The Jackal” Frampton and former four-division world titleholder Nonito Donaire in April, a fight won by the Northern Irish boxer. Frampton will defend his crown against Australian Luke “Action” Jackson at Belfast’s Windsor Park this Saturday night.